Roads in Paser and Penajam Paser Utara Districts, East Kalimantan which were previously still dark, are now getting brighter thanks to the presence of 325 Solar Street Lighting (PJU-TS) built by the Ministry of Energy and Mineral Resources through the Directorate General of Renewable Energy and Energy Conservation (EBTKE). 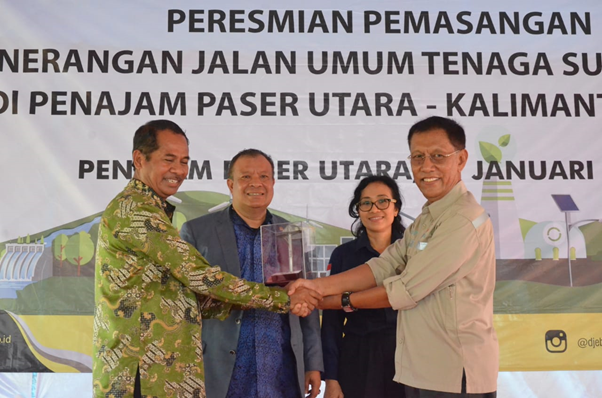 The symbolic surrender to the community of the construction of 325 units of PJU-TS in the area, took place in Penajam Paser Utara District on Monday (1/31). Local people hope the Government can re-build Solar Street Lighting (PJU-TS) or other infrastructure that supports information and energy supply in the region. "In our area, 8 units of Solar Street Lighting (PJU-TS) are built on the coastal area, this helps our tourism, night activities are safer. We hope the Government can fulfill our requests again. This is very important for us, for example to support the economy and support night activities the community, "said the Nipah-Nipah Village Head, whose Solar Street Lighting (PJU-TS) was built in his area. In detail, 200 PJU-TS units were built for Paser District, located in 20 villages in 10 sub-districts. 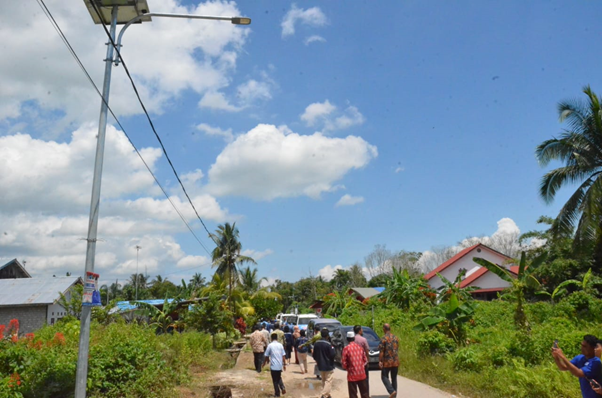 Meanwhile for Penajam Paser Utara District, 125 units of Solar Street Lighting (PJU-TS) were built for 4 sub-districts spread over 16 villages. Renaldy Dalimi, Member of the National Energy Board, representing the Government said, "The use of this Solar Street Lighting (PJU-TS) can be a solution for all of us. Not only environmentally friendly, but also assisting the implementation of Government programs in developing EBTKE. Ikhwan Datu Alam member of the House of Representatives Commission VII on this occasion. The construction of the Solar Street Lighting (PJU-TS) in this area does not escape from the respective roles and proposals of the District Government (Pemkab). After this submission, this Solar Street Lighting (PJU-TS) will be fully the responsibility of the Government and the local community. "The Solar Street Lighting (PJU-TS) that has been built will be managed and maintained by the respective Regency Government," said Renaldy. The submission of the Solar Street Lighting (PJU-TS) is a program carried out by the Ministry of Energy and Mineral Resources to accelerate the development of EBT electricity, considering that solar energy sources are very easy to obtain in Indonesia which is a form of implementation of our commitment in providing electricity access to the community while increasing utilization of renewable energy sources.